Glyn Colledge mug - 3⅜" (85 mm) high. Glyn Colledge (born July 23, 1922) took over the running of the hand-decorated stonewares department at Denby from his father, Albert, in 1950. The established Danesby Ware range was renamed Glyn Ware to mark the occasion. A new range, Glynbourne, was introduced in the 1960s. Very early pieces had the Colledge signature incised, but this was replaced by an applied signature due to firing difficulties. Glyn would hold the piece above his head in his right hand and sign it by brush with his left. By the 1970s the signature disappeared altogether. Colledge was influenced by Donald Gilbert, but his own influence in the post-war years was considerable and he is probably Denby's best known designer. After his retirement from Denby in 1983 Glyn continued to produce studio pottery from his home. He died September 9, 2000, at the age of seventy-eight. 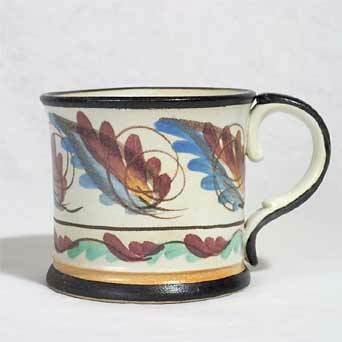 In 1806 William Bourne set up a pottery at Denby, in Derbyshire. A rich bed of fine stoneware clay had been discovered, and Bourne - a member of a well established family of potters - opened the pottery for his son, Joseph, to manage. After nearly two hundred years the company is still going strong. Originally known only for salt-glazed stonewares in subdued colours, in the early twentieth century more decorative pieces started to be made. In 1931 Norman Wood joined the firm and revolutionized the production methods. He installed high-capacity tunnel-kilns, which enabled the company to employ a new range of glazes. Donald Gilbert joined in 1934, as a designer, and Denby's potential for making decorative wares moved up another gear. Michael Cardew visited the pottery towards the end of 1944, and was impressed by the production methods which were very much more like his own concept of how pottery should be produced than those of the large companies in Stoke. The post war range was much enhanced by the work of designer, Glyn Colledge. In 1959 the company bought Lovatt and Lovatt, makers of Langley Ware, which continued to operate as a separate entity. The Denby Pottery Company, as it is known today, is still making ornamental and domestic wares of the high quality for which it has always been famous.